German teacher; born at Glogau June 3, 1819; died at Hanover March 31, 1880; head master of the religious school at Hanover. He made a German translation of the "Shebeṭ. Yehudah" of Solomon ibn Verga (Hanover, 1855; 2d ed. 1856; reprinted, Königsberg, 1858; Warsaw, 1882). He made also a German version of the "'Emeḳ ha-Baka" of Joseph ha-Kohen, adding a sketch of the life and works of the author (Leipsic, 1858). Further, Wiener was the author of "Regesten zur Geschichte der Juden in Deutschland Während des Mittelalters" (ib. 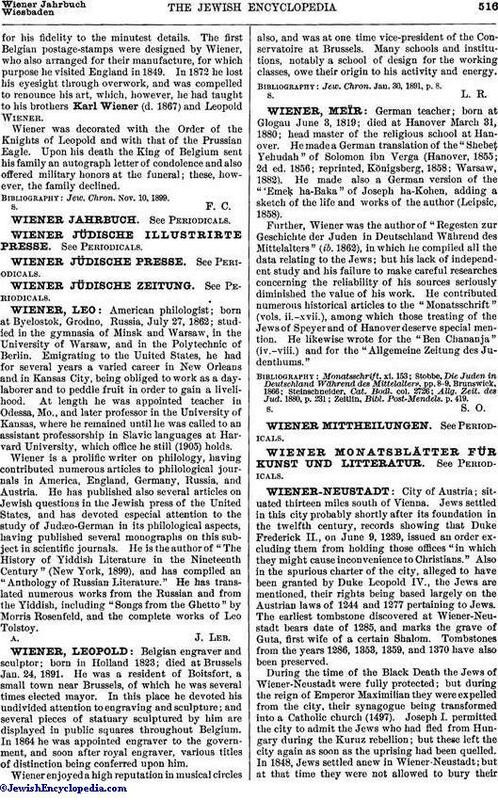 1862), in which he compiled all the data relating to the Jews; but his lack of independent study and his failure to make careful researches concerning the reliability of his sources seriously diminished the value of his work. He contributed numerous historical articles to the "Monatsschrift" (vols. ii.-xvii. ), among which those treating of the Jews of Speyer and of Hanover deserve special mention. He likewise wrote for the "Ben Chananja" (iv.-viii.) and for the "Allgemeine Zeitung des Judenthums." Zeitlin, Bibl. Post-Mendels. p. 419.